"Give a women the right make-up and she can conquer the world." At least that's what my make-up bag says this month. I'm a proponent of natural faces, but I rarely go out sans some sort of beauty product. I feel more confident when I feel like I look good, so I think the bag's quote is definitely on to something. 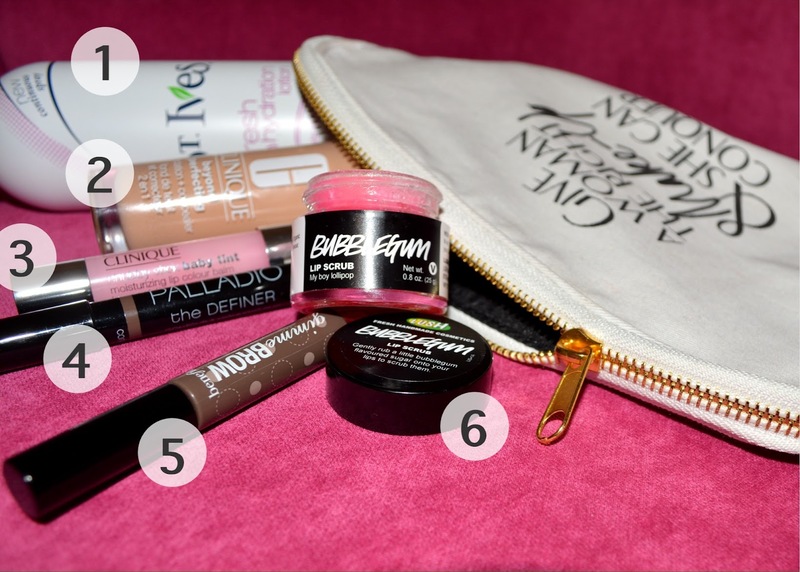 Here's a peek at what's toting around in my beauty bag this month. 1. St. Ives Indulgent Coconut Milk & Orchard Extract Fresh Hydration Lotion. I tried this lotion on last month while I was trudging around in ankle high mud. The continuous spray ensures even application and I am totally digging the fruity-floral smell. 2. Clinique Beyond Perfecting Foundation + Concealer. I have lots of redness, dark under eye circles and serious moisture issues. This bad boy tackles it all with a spongy applicator that makes application a snap! 3. Clinique Chubby Stick in Baby Tint. They had me at Chubby Stick. The whole Chubby Stick line is great. I love the moisturizing balm and sheer color options to pretty up my pout. Using them feels like I'm using JUMBO crayons, which makes it fool-proof for staying inside the lines. 4. Palladio The Definer Contour Crayon. Contouring can be a little intimidating, especially for beginners trying to navigate through all the powders, primers, brushes, and highlighters. This is a great tool for first-timers and experts alike. One end has the darker pencil for contouring and the other end has the highlighter. You draw on the contour color and blend before adding on the highlighter and presto, defined cheekbones! 5. Benefit Gimme Brow Wand. I was born with a Frida Kahlo uni brow, but could never rock it with as much confidence as she did. As a teen, I may have overtweezed some brow sections that I haven't seen since the early 2000s. To define what I've got and fill in what's been tragically lost, I swipe on a little of this stuff and I'm good to go. 6. Lush Bubble Gum Lip Scrub. First of all, it smells like a carton full of Bazooka chewing gum, which is reason enough to implement it into your lip regimen. Secondly, it's pink. Enough said. Seriously though, a little dab of it goes a long way on chapped lips. And after you've finished scrubbing away the dead or flaking lip skin, your lips look great and taste even better (for kissing your special someone). What're your go-to beauty finds for the summer?